Scripturally speaking, there is some significance to the birth of the messiah. The children of Israel longed for the day their savior would come, and the announcement of the birth was seen in the stars, such that kings from the east came to pay homage to the savior. Angels in heaven rejoiced and proclaimed the glory of God, bringing the news of the birth to common shephards, so that they may also rejoice. The birth of Christ was the fulfillment of prophecy, and was a demonstration of God's faithfulness. But after the fanfare of the birth, there's not much mention of it again in the scriptures. There's no moments of reflection or reverence on Jesus' birthday; New Testament authors don't suggest creating a holiday as a way to remember the birth. For believers, Christ's arrival in this world is a rather small part of the work Christ has actually done in their lives. The death and resurrection are far more significant. The scriptures state that Christ died and rose for believers; there is no such statement about the birth. And yes, it was a virgin birth. The birth of Christ was certainly a miracle...but what birth isn't? 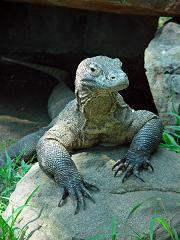 Incidentally, a virgin komodo dragon gave birth recently, making worldwide news. Should we cull out a holiday for the virgin komodo?